As energy-producing technology has become increasingly sophisticated, the level of reliance on wood as a fuel in the developed world has fallen. However, the need for renewable and sustainable energy sources is now widely accepted, and the use of wood as fuel has increased significantly in several parts of Europe. Woodfuel now accounts for 19% of primary energy production in Finland, 22% of rural domestic heating energy in Austria with plans to increase this to 40% by 2010, and approximately 35% of the Danish timber harvest is for woodfuel. As a result of this expansion, there are now well tested wood-burning technologies suitable for a range of different applications and scales. A fundamental aspect of bioenergy systems such as woodfuel is that they must be locally centred to be economically viable. Such an approach is ideally suited to rural Northern Europe where both the resource and the population is scattered; this is particularly true of peripheral areas. It enables supply and demand sides of the market to be matched to meet local energy, timber market and employment needs. Timber prices in peripheral areas of Northern Europe are currently low and are unlikely to rise significantly in the foreseeable future. This has created a large surplus of low grade timber, much of which is very remote from current markets. A well-developed woodfuel market could make good use of this currently under-exploited resource. Thus in terms of available technologies, resources and geography, woodfuel energy systems are an ideally suited to use in Northern Europe. Unlike other forms of renewable energy, biomass can be used to generate heat directly, rather than as electricity. This is a way of avoiding both the grid imposed limitations on energy generation in peripheral areas, and the transport costs associated with the wide fuel catchment areas required by large combined heat and power developments. Woodfuel is effectively carbon neutral because the carbon released during combustion is equivalent to that absorbed by the tree while it was growing. Therefore, in addition to having a proven technology, a resource, and a potential market, woodfuel is also an environmentally sound energy source. Aside from energy production, using woodfuel has wider positive effects in terms of forestry practice, employment and biodiversity. Forest thinning is often delayed or abandoned due to lack of markets for the produce. Unthinned crops can result in lower grade timber, more appropriate for large scale industrial fibre using industries than for local added value processing. The lower timber incomes from such crops are frequently exacerbated by high haulage costs to distant markets and can result in negative returns to timber growers. However, thinnings and low grade timber can be used as woodfuel. Establishing woodfuel heating schemes in peripheral areas would use this resource locally cutting the economic costs of haulage while increasing local forestry incomes and improving the value of timber crops. Furthermore, research has shown that high stocking densities are optimal for woodfuel harvests. This gives flexibility in terms of restocking, allowing use of silviculturally beneficial mixtures of native and exotic conifer species such as spruce/birch. There is a future option to remove one or the other in response to future changes in forest management prioties and in response to changing timber markets. For instance if softwood markets deteriorated or landscape and biodiversity issues gained in importance the spruce could be removed as woodfuel leaving a native woodland to develop. Alternatively if there was a shortfall in softwood supply and biodiversity imperatives were being met adequately elsewhere the birch could be removed as woodfuel having served its purpose as a nurse crop. There is also a middle “multi-purpose” option where an intimate mix could be thinned to produce discrete single species blocks of spruce or birch. Local employment and business opportunities can be created through operating woodfuel energy schemes at the local scale. Small scale supply chains require less specialist equipment and therefore provide opportunities for local contractors, community woodland groups and farmers to enter the market. Moreover, the improved quality of the remaining timber resource will further increase options for local added value processing. Finally, more mixed woodlands, and increased thinning and felling will improve the biodiversity of woodlands and forests. 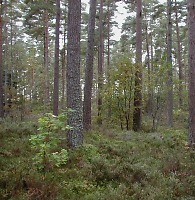 For example, thinning is a vital part of a major project aiming to recreate woodland habitats suitable for Capercaillie. Such management techniques will also improve landscape values and recreational values.